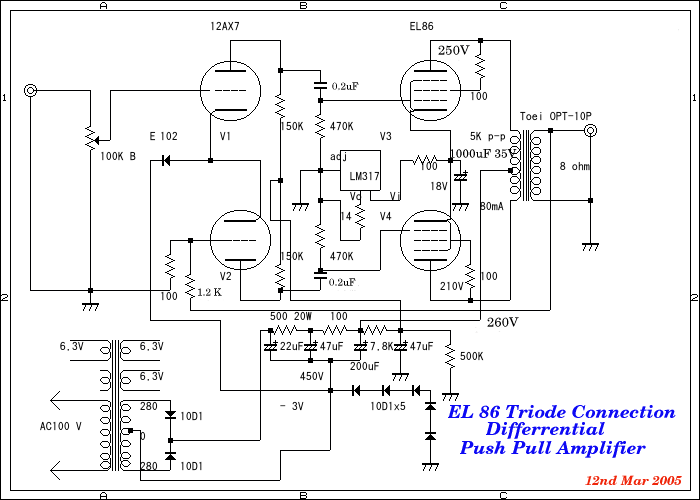 EL86 Triode connection differencial PushPull Amplifier. 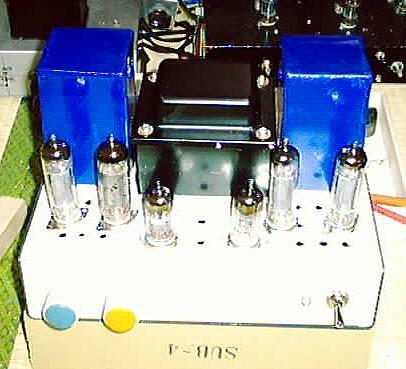 transfomer.valve are 4 of EL86 and 2 of 12AX7 . 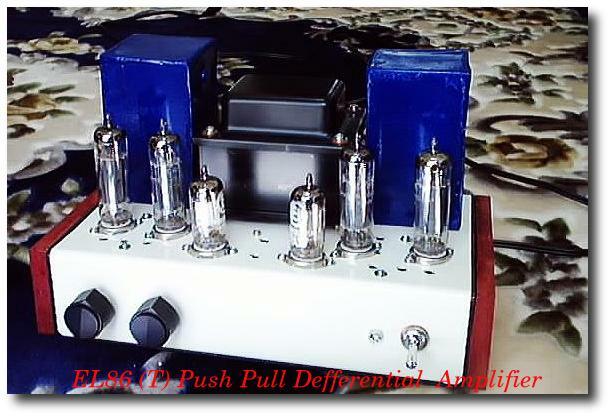 I will build up as a differencial push pull amplifier. rms. because doing class A under differential amplifier .so will be get power of around 5 W rms or more. Just I will show you circuit diagram here this one is some copy of the other web site and Based Mr Perque Amplifier from Japan Site. 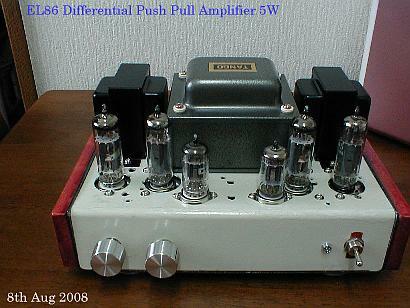 EL 86 are same as 6CW5 American name tubes, used be use for television audio line ,vertical sweep and Music Box. very low cost valuves avarable any where in country side.suppose be use Mullard are better for use.max plate voltage are some 250V be carefully chose plate voltage of EL86.each plate current are around 40mA each to adjusted resistance of No2 pin of LM 317 .and if does not use type of differential will be get more than 10 W rms in triode connection and pentode conditions will be get more than 12W rms depende on Power Transfomer and OUT PUT Transfomer in AB1 class Amplifier.this one is class A push pull amplifier.hight frequency are very nice to hear just like 45 sound. I think good for Clasic and some piano plays in Jazz.very sweet sound and very clear sound I got . specialy good for Violin.this time used low cost small out put transfomer too. 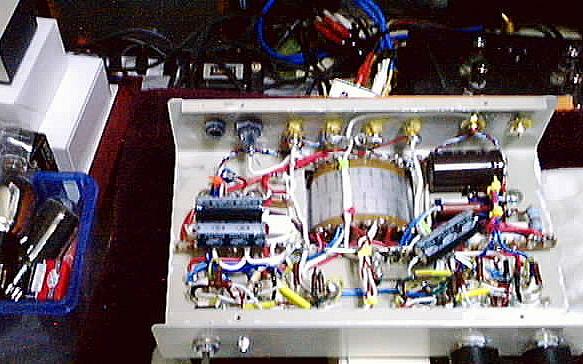 later I will check charactor of Amplifier if i have a time. hummmm mmm very sweet !!!!! sound like a direct heating valves.one thing power is very low . I got 5.5W rms, max is 8 W rms.frequency response from 10Hz to 30Khz are flat witin -1 dB .sound are very clear. ,,,,,,,,after closly 2week later I did replaced coupling capacitor for 4 of using oil capacitors. 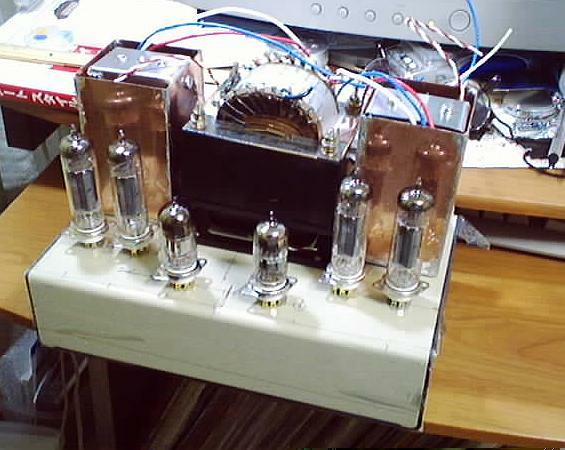 and some capacitors.small amplifier is became big sound amplifier but sound like Triode Single Ended Amplifier like a 300B .4 of EL86 are very cheap than any kind of many power tubes. 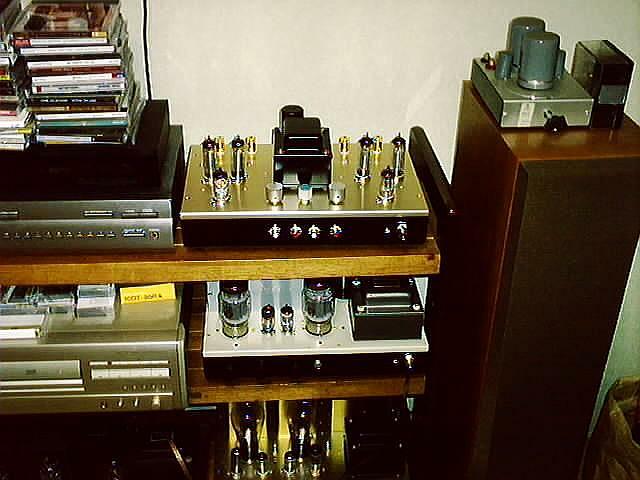 and sounds are very clear like a direct heating tubes amplifier.why anyone don't use this kind of tubes,even if connected pentode position you can get more than 10W rms and if with out diffrencial amplifier you can get more than 15W rms.but this one is very natural sound you can get surely. and some one said if you are choese to use some reguration circuit instead of LM317 ,will be get more natural than if you did used LM 317 regulator for grid bias of EL86. 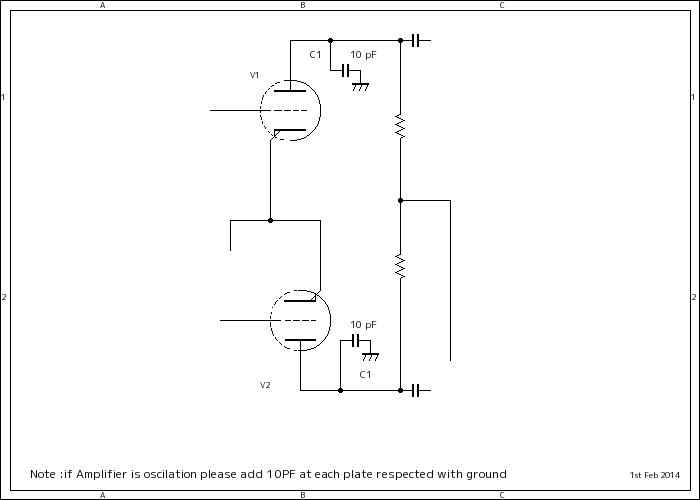 If Amplifier is oscilate please add around 10PF small capacitor each plate circuit of drive triode circuit. Transformar are a liitle bit highter level from Touei Transformar. Transformar are OTN-V6P S.E.L 8kp-p push pull transformar Max 10W. S.E.L is Sugano Electric Labolatory . famous Transformar company in Japan. Power Transformar is Tango MX-205 200mA Power Transformar. than before.nominal power is 8W rms at clip point.Max is 10W rms.